In a recent study by Maturity Benchmark study by Service Performance Insight, LLC, professional service companies listed “declining bill rates” and “drop in profits” among their chief concerns. If these are your concerns as well, your goal should be to help everyone on your staff be as productive and satisfied as possible. Acumatica can help you get the right people assigned to the right project at the right time to keep customers happy and billable hours high. Business intelligence and dashboards give businesses insights into customer trends and buying patterns. Acumatica leverages Microsoft Power BI as a self-service analytical tool, so staff can leverage your ERP data for greater insight into your service business. Self-service paralytics can empower users in so many different ways. They can drill down into the details of an intriguing visualization or figure. They can customize the presentation of data without IT help or better socialize information. They can prepare and integrate data from multiple sources to inspect problems from a new angle. Self-service, especially when supported by a cloud data hub, fosters a larger, more active user base that will make better decisions and disseminate insight across all lines of business. Store customer bids, orders, project information, and service requests in CRM so everyone will be on the same page when speaking with customers. Document procedures in a wiki in the business system. Attach scanned invoices to the electronic Accounts Payable form to save time and reduce costs. Increase productivity by automatically routing documents and tracking activities. Provide rules-based workflows to route documents, avoid delays, and signal when a required step falls behind schedule. Mobile access is an absolute requirement for information access in the field, on the road, at a client site, out of the office, or after hours. Access the system with any browser enabled device, anywhere, anytime. Extend access to everyone – without additional license costs. Allow customers to access account information and inquire on their projects through portals. Enable subcontractors to see project information and report their time and progress. Provide mobile time and expense reporting and information access for employees. Ensure everyone in your organization works with the same version of the truth so there is no lost productivity reconciling different versions of reports. Eliminate double entry – save time and reduce errors. Have instant access to information across the entire organization. Reduce costs – the total cost of ownership (TCO) for a single integrated system is much less than for multiple disparate systems. Increase or decrease capacity as needed. Software-as-a-Service (SaaS) allows you reduces upfront costs, pay for the resources you need, and eliminate significant ongoing IT costs. A modern, fully integrated system. SaaS as a licensing option. One set of code – not a separate version for mobile. Access from anywhere, on any device with a browser. Embedded workflow and document management (including wikis). 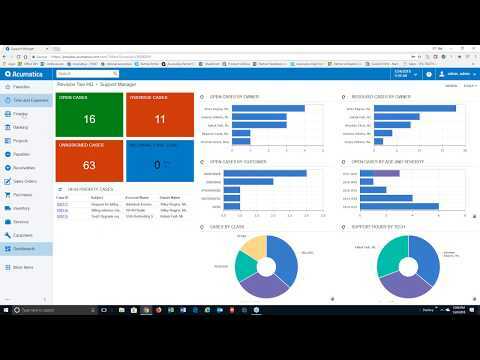 Native BI integration to Microsoft PowerBI. Ready to slash costs and optimize your field service operations? Get great insights about assigning the right field service technician with the right parts and/or product, the right skill, at the right time and location to address the customers need.